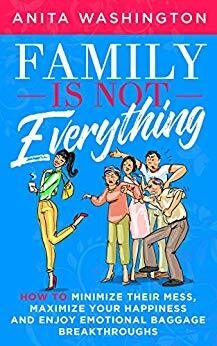 How To Minimize Their Mess, Maximize Your Happiness and Enjoy Emotional Baggage Breakthroughs, author Anita Washington details personal stories of surviving a homicidal alcoholic father, a neglectful mother and an emotionally and physically abusive brother to show you how childhood trauma turns into adult dysfunctional behavior. She includes lessons to learn from her abuse and her life-altering mistakes, along with teaching you how to use the affirmations, techniques and activities of her 7-Step Method to resolve the effects of emotional baggage and create a life of purpose and meaning. The 7-Step Method is a process of seven sequential steps she had seen produce the greatest results. It has not only worked to improve her life and the lives of her previous clients, but it can also work for you. Reading this book you will: Be equipped to boldly go beyond your comfort zone and refresh, reinvent, and revise your life for the better. Learn how to transform negative thinking into positive thinking with 7 affirmations, 7 results-driven techniques, and 7 actionable activities. Learn how to defy your limiting beliefs about yourself and create a life you’ll love living. $2.99 on Kindle.